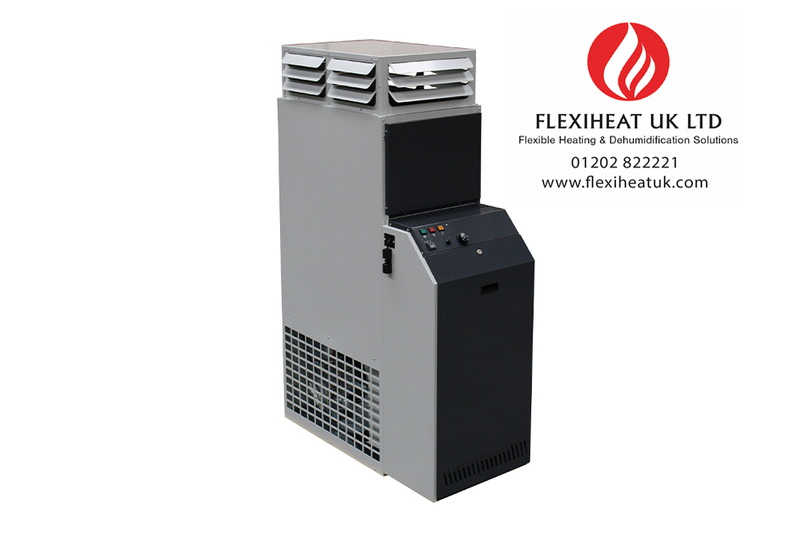 These industrial oil heaters have an integral fuel tank which is capable of supporting approx 20 hours of continuous running; although, with the built-in room thermostat, which has a range of +5/+30°C, controls the area to the required temperature automatically. Large built-in oil tank with filter – BA 30 Plus – 75 Ltrs , BA 60 Plus – 90 Ltrs , BA 100 Plus diesel tank is sold separately as an accessory. Centrifugal fan, Fan section with one centrifugal fan, equipped with one electric single phase motor directly coupled to the fan wheel. Stainless steel combustion chamber and a three pass heat exchanger built from high quality steel, complete with inspection doors, chimney connection and burner mounting plate with insulation. 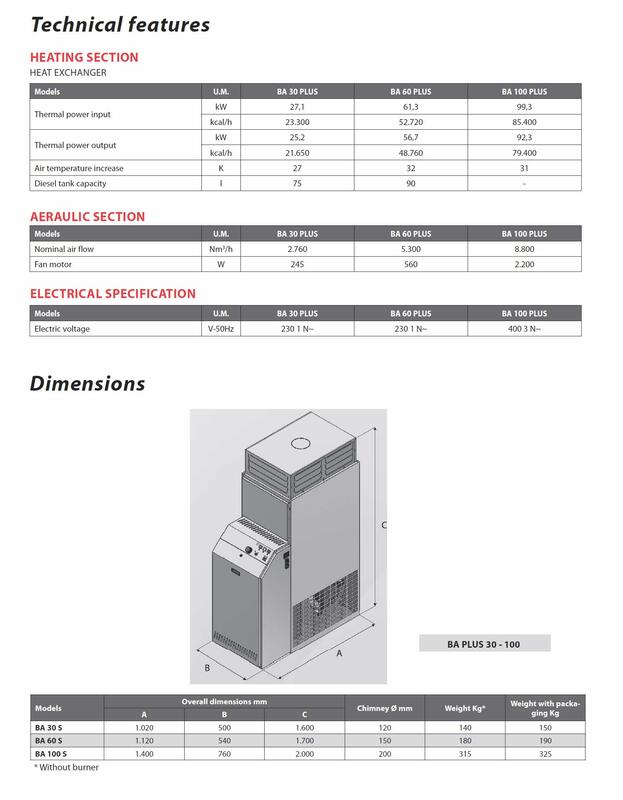 Air outlet diffusion plenum with air delivery openings on the four sides and horizontal individually adjustable pre-cut fins. Oil burner complete with electronic devices, nozzle, flexible pipes and filter. Fan Thermostat – it activates the fan (maximum 60 seconds) after the burner has started and it stops it (approximately 4 minutes) after it has stopped. 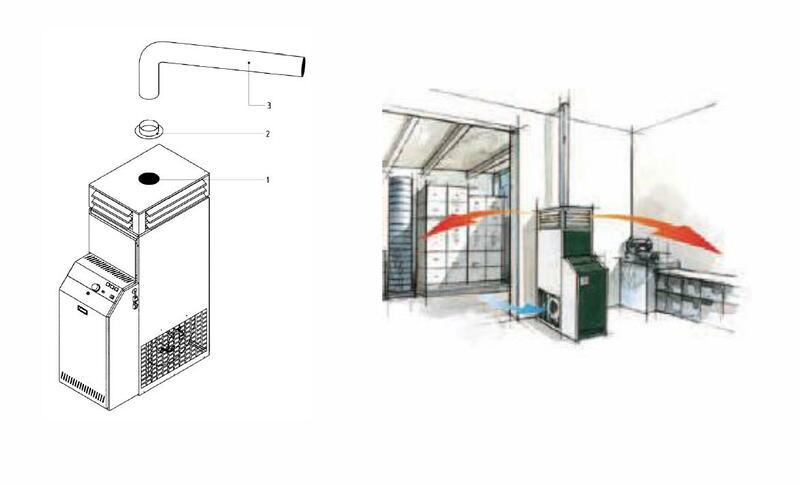 Thus, it prevents unpleasantly cold air from being released in the area where the warm air heater is activated and the thermal energy accumulated by the heat exchanger can be exhausted, by completely using it before the warm air heater stops. 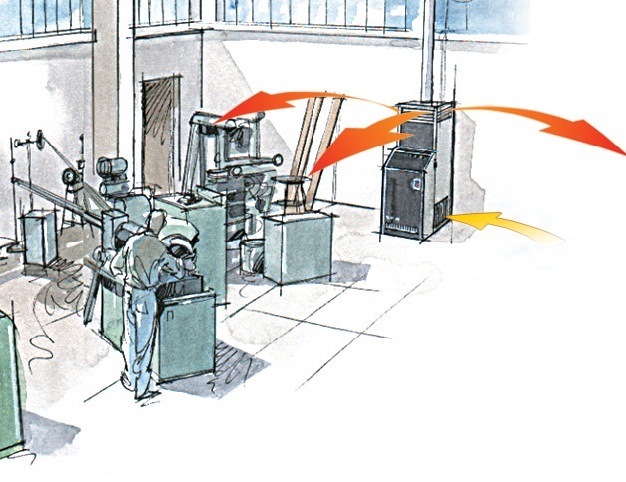 The operation of the BAS range of warm air oil heaters, consists of the Riello oil burner , which pre-heats the combustion chamber, prior to the centrifugal fan dispersing the heat; this ensures that the unit does not expel cold or tepid air into the area being heated.